A native of Barrow-in-Furness, England, at 17 years played semi-professional for his home town team. David moved to the US at age 20 when accepting a full scholarship to attend West Virginia Wesleyan College. As a player at Wesleyan, he participated in their NAIA National Championship winning team in his first year and also captained the team through 1996-98. David was named on the All-Conference team for all of his four years of playing. He completed his MBA at WVWC before moving to New Hampshire in 1999. David will be voted into the WVWC Hall of Fame as part of the 1994 Championship team in 2012. 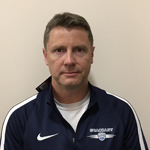 During his 16 years at Seacoast United, David has coached and developed many boys and girls teams; highlighted by winning Super Y National Championships in 2009 and 2011. David has helped grow the Grassroots, Junior Academy and Community programs as well as manage the Indoor Arena in Hampton. His current position is Director of Facilities and Operations.